In this quick start, a Docker CE cluster is deployed using the Azure CLI. A multi-container application consisting of web front-end and a Redis instance is then deployed and run on the cluster. Once completed, the application is accessible over the internet. Docker CE on Azure Container Service is in preview and should not be used for production workloads. The following example creates a resource group named myResourceGroup in the westus2 location. The following example creates a cluster named mySwarmCluster with one Linux master node and three Linux agent nodes. Throughout this quick start, you need the FQDN of both the Docker Swarm master and the Docker agent pool. Run the following command to return both the master and agent FQDNs. Create an SSH tunnel to the Swarm master. Replace MasterFQDN with the FQDN address of the Swarm master. Set the DOCKER_HOST environment variable. This allows you to run docker commands against the Docker Swarm without having to specify the name of the host. You are now ready to run Docker services on the Docker Swarm. Create a file named azure-vote.yaml and copy the following content into it. 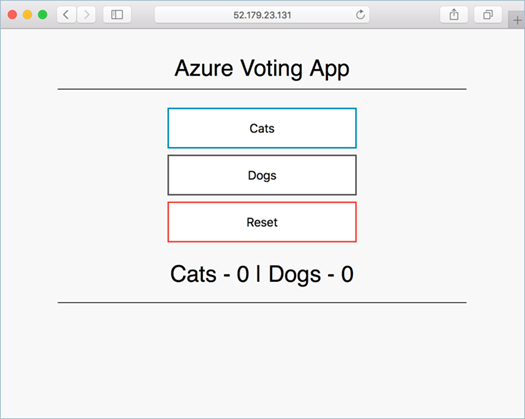 Run the docker stack deploy command to create the Azure Vote service. Use the docker stack ps command to return the deployment status of the application. Once the CURRENT STATE of each service is Running, the application is ready. Browse to the FQDN of the Swarm agent pool to test out the Azure Vote application. In this quick start, pre-created container images have been used to create a Docker service. The related application code, Dockerfile, and Compose file are available on GitHub. In this quick start, you deployed a Docker Swarm cluster and deployed a multi-container application to it. To learn about integrating Docker swarm with Azure DevOps, continue to the CI/CD with Docker Swarm and Azure DevOps.